My favourite character would be BRAINY! Why?This is because i love brainy people and always dream to be like those brainy people out there, for sure brainy people can live and survive when they have problems and problems without depending on the others. This is why i love this character because brainy is the mastermind and always step ahead in front of the others when making a serious and important decision making! 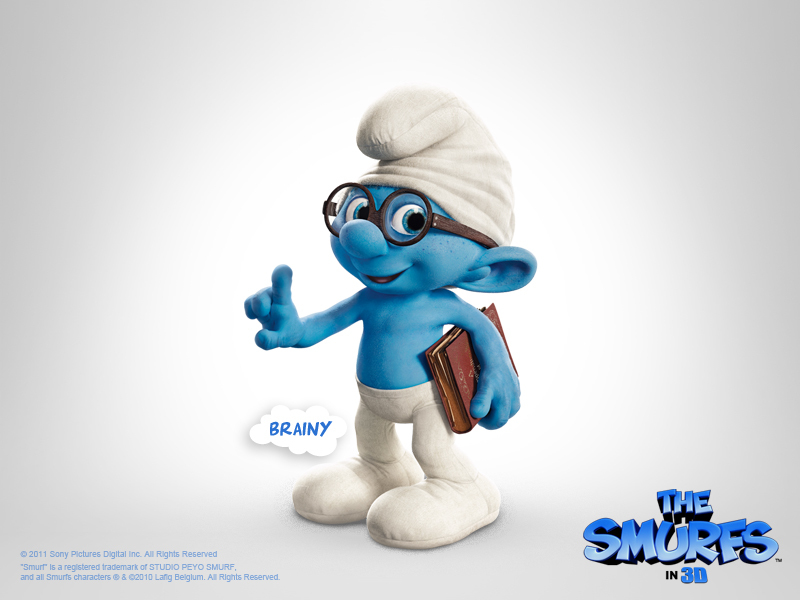 How Brainy can help the other smurfs? ?Can Brainy help? Basically,brainy have its own strategy in developing the ideas and decision in help lead the others and find their way from New York City back to Smurf Village. To have intelligent mind its not a simple and easy job as other smurfs is depending on Brainy strategy to find a perfect way before evil wizard Gargamel tracks them down and crash them all without mercy. Firstly, to help the other smurfs,Brainy apply DISGUISE method which can be use safely by wearing a mouse costume or face painting to avoid the evil to identified them while walking and using public transport. Next,Brainy apply UNITY method because he believes that no single action in the world would be successful if no cooperation between fellow done,what Brainy means is that when smurfs walk,sleep,hike,eat and run must be done together as together we stand,divided we fall.Finally,Brainy urge the others to focus on this method which is TARGET method, Brainy clears that target method is a process to define and track the enemies special,weakness,threat and opportunities. By using the swot system,smurfs can defeat their enemies by knowing their enemies pro and cons. Lastly,Brainy advices to all the smurfs that we dont need a thousands strategies,we dont need a thousands friends as deep inside our heart the faith is there waiting for us to welcome the truth for those who are believing.